Our San German house had corazones (kind of pinkish, sweet and oddly grainy fruit) and some grenade looking white fruits that tasted just like a corazone but had a bunch of seeds you had to eat around. We were unimpressed with the grenade-type fruit and cut the tree down. I have a policy of generally not wanting to cut anything down unless it is disgusting or ugly or both. This tree wasn't pretty and the fruit was crappy. I was happy to find corazones at our Moca house and even happier when they turned out to be a crimson red color with red flesh. The ugly tree is down on the property where we don't have to look at it so it is perfect! On the side of the house is another kind of annona - the grenade-looking kind. I decided to give every odd fruit a fruiting cycle before I consider taking it out. 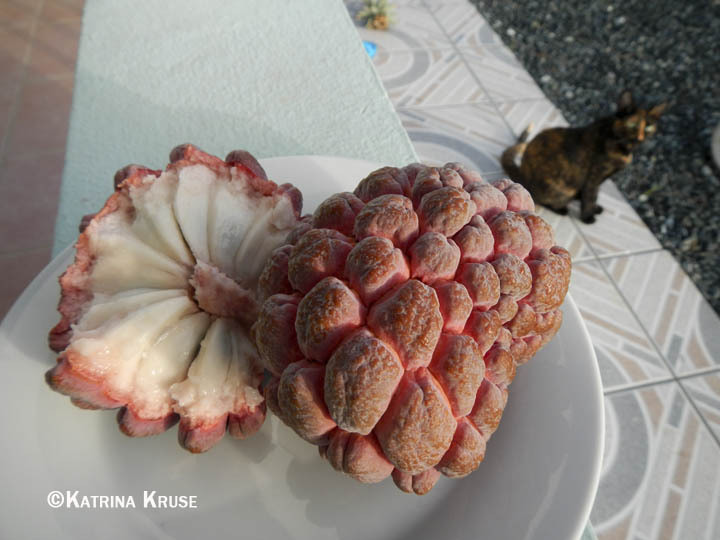 I have been watching the grenade annona and the fruit is finally ready. I expected to be unimpressed and expected to get the saw out for tree removal. I am pleasantly surprised! Our other house's fruit looked like this only not pink. I expected this to taste the same and it is different (a good thing). This has a juicy, pineapple flavored pulp that is worth eating. There are a ton of seeds, but the pulp packet around each one is delish! For now the tree stays and I am harvesting these odd fruits every day or two. The texture isn't grainy at all so it is staying. The tree is small and not really nice looking. It'll fit in any mid-size yard and is kind of open in form. You can't really do much with the fruit because you don't get enough at once and of course you have the seeds to deal with. It'd make a good ice cream but would take an army of trees to have enough fruit at one time to make it practical. It isn't THAT good. You don't want to dedicate that much space for it but it is a cool shape and has a nice taste. Plant one!